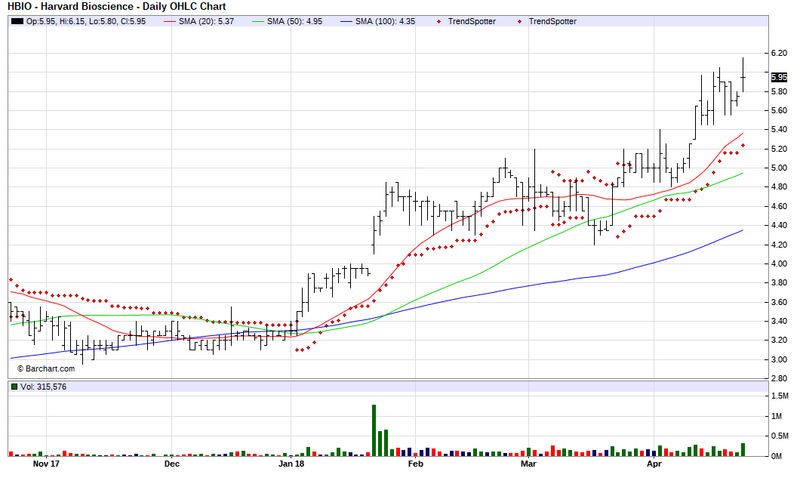 The Chart of the Day belongs to Harvard Bioscience (HBIO). I found the scientific instrument stock by using Barchart to sort today's Top Stocks to Ownlist first by the highest Weighted Alpha, then I used the Flipchart feature to review the charts for consistent price appreciation over the last 6 months. Since the Trend Spotter signaled a buy on 3/27 the stock gained 15.53%. Harvard Bioscience develops, manufactures and markets tools used in drug discovery research at pharmaceutical and biotechnology companies, universities and government laboratories. Earnings estimated to increase 66.70% this year, an additional 30.00% next year and continue to compound at an annual rate of 10.00% for the next 5 years.